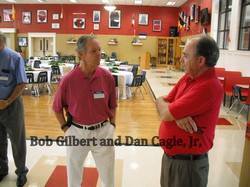 A 50s - 60s Multi-Class reunion was held on June 10th, 2017 at the Jefferson High School Cafeteria - Hosted by the "Class of 1958." 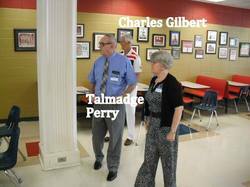 Multi-Class Reunion to be held on June 10th at the Jefferson High School cafeteria. Cost is $10.00 per person. Originally the classes from 1954 through 1964 were planned. That has been expanded to 1952 through 1969 at this time. Please register by e mail to Cecil Buffington at fishh64@yahoo.com by May 26th. Please mail your attendance fee to : Cecil Buffington, 1228 Old Pendergrass Road, Jefferson, Georgia, 30549 or Charles Gilbert at 3820 Valley Green Dr., Marietta, Georgia, 30068 or whomever the planning committee member is that you register with. Food will be catered by Beef O'Brady and will be a buffet including Grilled Steak and Rice Platter, Chicken and Rice Platter, Fresh Fruit Platter, Chicken Finger Platter, Sandwich Wrap Platter, Desert and ice tea and lemonade for drinks. Any other classes from pre-1970 are welcome to attend if desired. 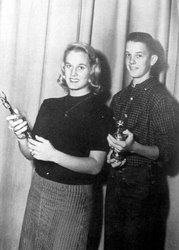 Just register by the deadline and event chairman Johnny Anglin of the Class of '58, the class hosting the event, has stated that all JHS graduates from this time-period will be welcome at the event. It was a night when the base . 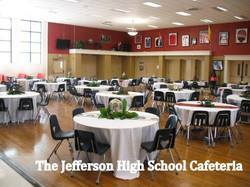 . . that helped establish the golden-age era ~ 1946 - 1969 ~ student culture at Jefferson High School . . . came together. It was, indeed, a fun night for everyone that attended the event. 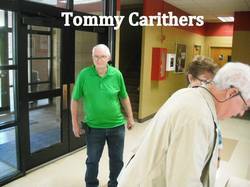 Thanks, "Class of '58" ~ you are a high class act and put on a great show . . .
50s - 60s - Multi-Class Reunion Tribute Video. 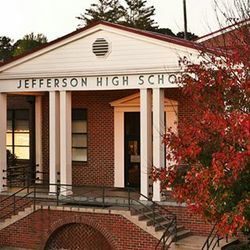 Current entrance to Jefferson High School. 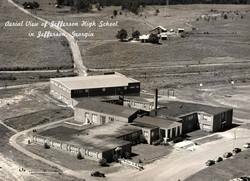 Jefferson High School in 1952. 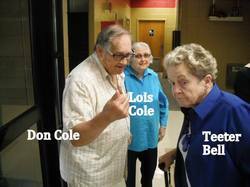 The Class of 1958. 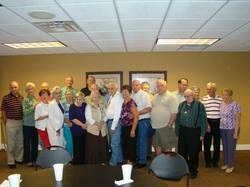 - 50th reunion - Front row - L-R - Lynda Hunter ( Hawkins ), Jack Crisler, Junan Crisler ( Davis ), Glenda Tolbert ( Gee ), Barbara Eberhart ( Hemphill ), Doris Skelton ( Lord ), Ann Dalton ( Hewett ), James ( Jim ) Stringer, Mary Grace Blackstock ( Curruth ), Charles Anglin, Donald McEver, Charles Anglin, Maxine Brown ( Lord ). Back Row - L-R - Melvin Tolbert, Charles Gilbert, Shelby Langford ( Hicks ), Johnny Melvin, Johnny Davis, Norman Botelho, Sewell Blackstock, Tommy Carithers, Don Truluck, Donald Lord. Present but not in picture - Carol Murphy, Mary Eula Whittimote McKnight, Early McKnight, Martha Brooks Floyd, Sue Brown Truluck, James T. Lord. 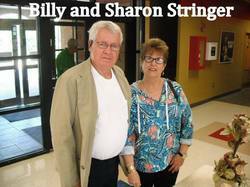 Guests - Mr. Haley A. Fleming, Sue Holliman, Donald Eberhart, Woodie Murphy, Larry Brooks, Donald Cole, and Cecil Buffington. 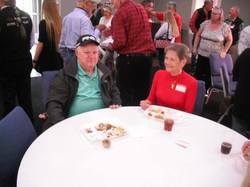 The Class of 1958 served as hosts of the 2017, 50s - 60s multi-class reunion on June 10th at the Jefferson High School Cafeteria. 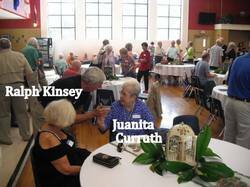 Over 120 people were in attendance at the event. It was exceptional in every way. 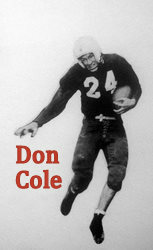 Thank you Class of 1958 . . .
Donald Cole was an exceptional Jefferson running back and track performer from 1950 - 1953. 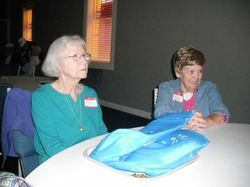 Reba Ricks Holmes and Doris Skelton Lord look in on the festivities at the 50s - 60s reunion. 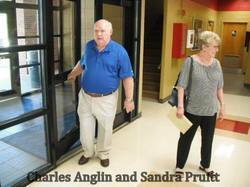 Charles Anglin and Brenda Samples Riddle talk about the "good ol' days." 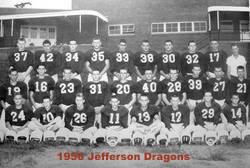 The 1952 Jefferson Dragons Coached by John W. Davis. ~ First Row; Left to Right; Sidney Johnson, Dwight Howard, Robin Self, Y.D. Maddox, Billy Wilbanks, Robert Taylor, Manager. Second Row; Left to Right: Charles Middlebrooks, Davis Roberts, Marvin Hall, Gerald Brookshire, Nelson Tolbert, and Donald Cole. Third Row; Left to Right; Thomas Crenshaw, Mack Elder, John Anderson, Prince Watkins, Jerry Johnson and Jimmy McRee. Fourth Row; Left to Right; Caroll Dadsiman, Raymond Adams, Charlie Barrett, Earl Carithers and Billy Sailors. 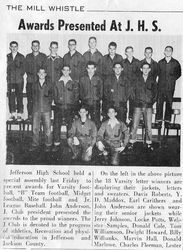 The 1953 Jefferson Dragon Football Team ~ First Row ~ Left to Right; Carithers, Manager, Langford, Stansel, Marlow, Cutts, Wages, Duke and Hall. Second Row ~ Left to Right; McMullan, Howard, Toney, Wilbanks, Taylor and Maddox. Third Row ~ Left to Right; Williamson, Johnson, J. Johnson, Anderson, Potts, Carithers, Roberts and Samples. First Row ~ Left to Right: Jerry Johnson, Gilmer Glenn, Bobby Davis, Bucky Johnson, Howard Cooper, Webster Samples, Locke Potts and Jackie Scott. Second Row ~ Left to Right; Gus Johnson, Ed Stancil, Benny Tompkins, Allen Duffel, Bobby Manus, Eugene Doster, Wayne Wages and Captain Dwight Howard. Third Row ~ Left to Right; Robert Taylor, Woodrow Stewart, Donald Marlow, Hoke Elrod, Roger Maddox, Marvin Hall, Billy Wilbanks and Donald Cole. First Row~ Left to Right; Dan Hutchins, Robert Taylor, Charles Gilbert, Bobby Manus, Second Row ~ Left to Right; Donald Marlow, Monk Tolbert, Wayne Wages, Ed Stancil and Columbus Williamson. Third Row ~ Left to Right; Gilmer Glenn, Benny Thompkins, Bucky Johnson, Jerry Black, Webster Samples, C. Fleeman, H, Cooper and Woodrow Stewart. 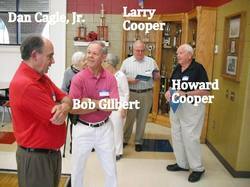 Not shown Billy Ricks, Howard Langford and and Bobby Nix. First Row ~ Left to Right; T. Taylor, B. Potter, G, Duke, D, Gasaway, G. Johnson, S, Scott, J. Kesler, C. Gilbert, Second Row ~ Left to Right; D. Berryman, F. Gilbert, M. Tolbert, W. Wages, L. Williamson, O. Whitmite, J. Gooch, H. Harris, B. Ricks, a. Logan. Third Row ~ Left to Right; R. Tolbert, J. Parr, C. Williamson, G. Glenn, J. Black, W. Samples, B. Tompkins, W. Finch, W. Stewart, Manager C. Fleeman. The 1957 Dragon Football squad; First Row ~ Left to Right; Stringer, Nichols, Logan, Whitmire, Wilson, Lyle, Scott, Blackstock, Waddell, Venable. Second Row ~ Left to Right; Williamson, Tolbert, Anglin, Potter, Duke, Brothers, Kesler, Botelho, Davis and Jackson. Third Row ~ Left to Right; Aaron, Brooks, Foster, Gilbert, gasaway, Tolbert, Lord, Storey and Manager John Davis. 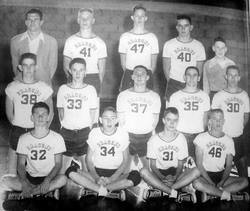 1953 - 54 Jefferson Dragons Basketball Team. First Row ~ Left to Right; Wayne Wages, Hershel Middlebrooks, Howard. Langford and Billy Wilbanks, Second Row ~ Left to Right; Davis Roberts, Tommy Henderson, Marvin Hall, Y.D. 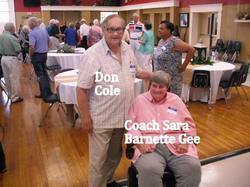 Maddox and Don Cole. 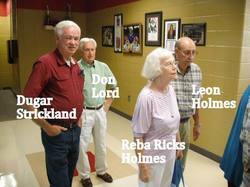 Third Row ~ Left to Right; Coach Henderson, Locke Potts, Jerry Edwards, John Anderson and M. Davis, Manager. First Row, Left to Right; L. Wood, B. Tolbert, D. Gause, R. Kinsey, J. Sexton, S. Jackson, W. Foster, R. Langford. Second Row, Left to Right; G. Duke, L. Brothers, J. Kesler, J. Aaron, D. Wise, J. Davis, M. Venable, T. Carithers. Third Row, Left to Right; J. Lyle, B. Riddle, E. Marlow, D. Tatum, B. Porter, D. Tompkins, J. Waddell, Manager Herbert Wilson. Players not pictured; George Waddell and Sammy Scott. 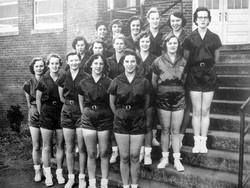 The 1955 - 56 Jefferson High School Dragonettes - Front Row ~ Left to Right; Barbara Eberhart, Junan Davis, Linda Meade, Emma Lou Murphy, Mary Frances McNeal. Second Row ~ Left to Right; Reba Ricks, Doris Skelton, Sarah Ellen Shropshire, Kathleen Whitehead, Marcia Head. Third Row ~ Left to Right; Mary Nell Davis, Martha Langford, Martha Ann Langford, Bobbie Wilson, Doris Garrison and Lilly Murphy. 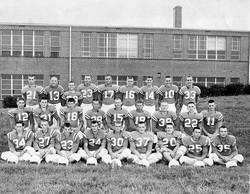 1959 Jefferson Dragons. First Row ~ Left to Right; B. Porter, R. Jackson, R. Kinsey, D. Gause, L. Wood, J. Sexton. Second Row ~ Left to Right; E. Marlow, T. Venable, R. Langford, D. Tompkins, L Cooper, J. Davis, D. Wise. Third Row ~ Left to Right; Manager Richard Gearin, J. Waddell, B. Riddle and H. Wilson. 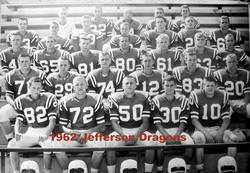 1960 Jefferson Dragons ~ First Row, L-R; Buck Tolbert, John Parks, John Davis, Jr., Jerry Middlebrooks, Jimmy Sexton, Larry Benton. Second Row, L-R; Roger Jackson, Eddie Marlow, Wayne Butler, Ralph Kinsey, Earle Tompkins, Michael Arnold, Larry Cooper. Third Row, L-R; George Waddell, Brian Duke, Burton Riddle, Jeff Davis, Jerry Waddell, Don Tompkins, Harold Bone and Damon West. 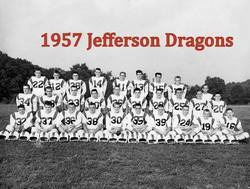 1961 Jefferson Dragons. First Row - L - R; Terry Marlow, Roger Stover, Harold Bone, Billy Curruth, Jerry Fletcher, Jerry Waddell, Don Tompkins, Damon Gause. Second Row - L - R; Damon West, John Parks, Roger Jackson, Thomas Bond, Jack Wilson, Jerry Sailors, Larry Cooper, Rod Johnson, Kesler Perry. Third Row - L - R; Buck Tolbert, Richard Gearin, Bob Gilbert, Jerry Gearin, John Davis, Larry Benton, Tommy Riddle, Brian Duke, Jimmy Benson. 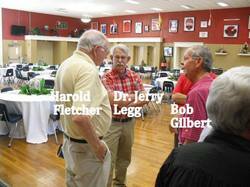 Firts Row - L - R; Thomas Bond, Mike Arnold, Earle Tompkins, Buck Tolbert, Roger Jackson. Second Row - L- R: John Parks, Ronnie Johnson, Dennis Wright, Mike Cotton, Gary Brooks, Terry Cotton. Third Row - L- R: Rod Johnson, Howard Sauls, Harold Bone, Cecil Buffington, Walton Halski, Larry Fletcher, Jerry Gearin. Fourth Row - L - R: Mike Welborn, George Kesler, Steve Wilson, David Gooch, Jerry Gearin. Fifth Row - L- R: Manager Doyle Strickland, Billy Duke, Richard Gearin, Gerald Foster, Bob Gilbert. Football Team: First Row - L - R; G. Foster, R. Johnson, G. Kesler, B. Duke, D. Hancock, J. Stovall, E. Watson, L. Stewart, D. Murphy, C. Godfrey. Second Row - L- R; M. Cotton, C. Anglin, G. Thurmond, D. Beatty, H. Sauls, D. Watson, B. Ray, T. Beatty, J. C. McEver, W. Storey. Third Row - L - R; R. Cooper, J. Bishop, R. Johnson, T. Nabors, M. Burnett, S. Bryan, C. Hooper, J. Beatty, H. Williams, J. Elrod. Fourth Row - L- R; K. Rosser, C. Fuller, S. Wilson, M. McCain, D. Foster, D. McEver. This was Coach John Davis' last Jefferson football team. Coach Jim Lofton's first Jefferson Dragon football team. The Jim Lofton coached team went 8 - 1 - 1 and shut out 6 opponents during the season. Still a Dragon record for shutouts in a 10 game season.